Gerald Voecks (left), Michael Hecht (second from left), and Jeff Hoffman (right) are working on technology to turn carbon dioxide into oxygen on Mars. At an age when most are retired or thinking hard about it, they’ve put their minds together to help solve one of the great puzzles of human interplanetary travel. And NASA has awarded them $30 million to press on. To be clear, these elder statesmen of science don’t plan to pay a visit themselves. They are building an oxygen-generating machine to ride aboard the unmanned Mars 2020 rover, an early version of a technology that could enable the next generation to breathe and burn fuel on Mars — and power their way home. Perhaps it’s no coincidence that the abbreviated acronym for their instrument — the Mars Oxygen In-Situ Resources Utilization Experiment — is MOXIE. An MIT-based experiment was one of seven chosen from 58 proposals to ride on the Mars 2020 rover. The other team members are not quite as, ahem, experienced as Rapp. But they’re also not the newest kids on the block. 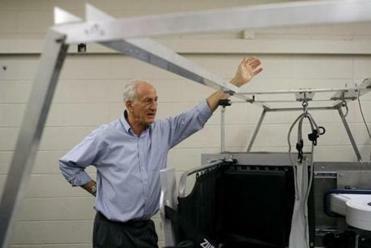 Jeffrey Hoffman, 70, has been to space five times. Gerald Voecks, a 74-year-old mostly-retired scientist, has been thinking about how to use local resources on Mars to create rocket fuel and oxygen on and off for most of his career. Peter Smith, 66, led the Phoenix Mars Lander before retiring from the University of Arizona to start a company (and run a bed and breakfast). There are younger people on the team, too. 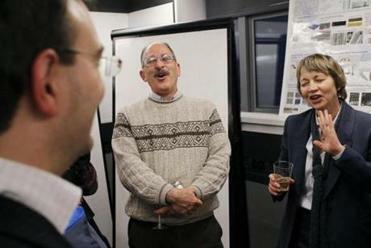 But when introducing themselves recently at the kickoff meeting for the collaboration in Cambridge, they placed themselves in the sweep of space exploration history. One said he was born back when Sputnik was still transmitting. He was heckled by a colleague in the back row who noted he was born before the Soviet satellite was launched in 1957. Which is why the leader of the group, a 61-year-old whippersnapper named Michael Hecht, felt a little like he’d been plunged into the movie “Space Cowboys” when he learned the team’s proposal had been chosen by the National Aeronautics and Space Administration. In the film, retired pilots come out of retirement to repair an out-of-control satellite. 61-year-old whippersnapper Michael Hecht (center) felt like he’d been plunged into the movie “Space Cowboys” when he learned NASA had chosen the team’s proposal. “I thought I had moved my career on to radio science and radio astronomy. And yet Mars and human exploration reached out and pulled me back in,” said Hecht, who is now associate director for research management at MIT’s Haystack Observatory. NASA announced in July that Hecht’s team had been chosen. Now, all this expertise is being leveled at a big problem for future human exploration of Mars: how to provide oxygen both for breathing and to burn fuel on the return trip. Although people rarely think about it on Earth, where oxygen is plentiful, burning fuel requires oxygen — an essential ingredient for combustion. Oxygen is in short supply on Mars, so unless there’s a way to make it on the spot, astronauts who want to return to Earth will have to lug lots of it with them. MOXIE will take in carbon dioxide from the Martian atmosphere and use electricity to convert it into oxygen, with a carbon monoxide byproduct. Unlike the chemistry or geology experiments aboard other robotic missions, this experiment is not just about exploring Mars. Instead, it’s aimed at understanding how to use what’s there. This team seems well suited to the task. When the scientists and engineers talk about their work, they seem to be picking up on a project they have all been thinking about for decades. “The experience we’ve had helps to show us when you want to be bold and step out and take some chances,” Voecks said. In the mid-1970s, Voecks was just beginning his career at the Jet Propulsion Laboratory, working on questions about how the organic compounds that are the building blocks of life could have arisen. After the Viking missions landed and provided a detailed look at Mars, however, he started to examine whether local Martian resources could be used to produce fuel and oxygen. Over the years, his research deviated to other areas — including designing a material that was carried up to help repair the optics of the Hubble Space Telescope. Hoffman, meanwhile, was a research scientist at MIT, where he took on Hecht as a graduate student for a few years. Then, he built his career around exploring space — in person. A five-time astronaut, he repaired the Hubble Space Telescope in 1993, installing Voecks’s material. In 2001, he returned to MIT, where he has continued to work on projects to enable future human spaceflight. Jeffrey Hoffman, 70, has been to space five times. Hecht finished his graduate degree at Stanford University and went on to work at the Jet Propulsion Laboratory, where he became interested in space exploration. He served as project manager for a package of instruments, intended to fly on a 2001 mission, that would probe a part of the Martian environment that could hold hazards for human explorers and their equipment — soil and dust. Peter Smith built the experiment’s optical microscope. But after the loss of the Mars Polar Lander in 1999, the mission was canceled. Later, when Smith headed up the Phoenix Mars Lander, they revived their instrument. Hecht left the laboratory in 2012, but NASA’s call for proposals for the Mars 2020 rover was an opportunity too good to pass up. At MIT, he was reunited with Hoffman, after a 25-year hiatus, and it wasn’t long before the two of them — and many other old friends and colleagues — were hatching a plan to work together again on the oygen-generating project. Although the senior leaders credit their experience, intertwined careers, and historical perspective for helping shape and guide MOXIE, they note that none of it would be possible without the younger members of the team, whose expertise and energy are crucial. As the group goes through the hard process of troubleshooting, preparing for NASA’s milestones, and coordinating with scientists across the country, they have one thing in mind: learning as much as possible about how to generate oxygen on Mars. They see MOXIE as the first draft of a technology that will be crucial for human missions to Mars for generations to come, though not necessarily for them. “Us old guys won’t be around forever,” Smith said. Carolyn Y. Johnson can be reached at cjohnson@ globe.com. Follow her on Twitter @carolynyjohnson.